Workers at Argos distribution sites have embarked on a week long strike against long hours, weekend working, excessive targets and bullying management. 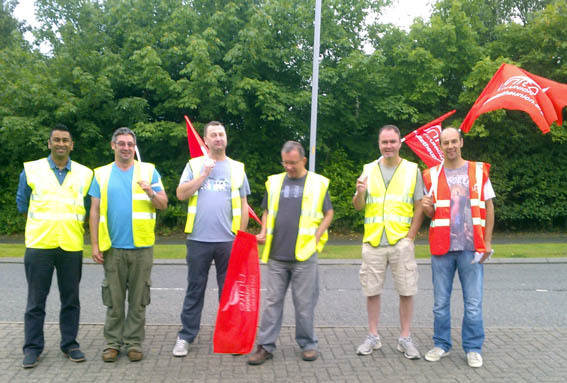 All shifts at the Magna Park site have been picketed since Sunday. Strikers today said support from union members has been excellent. Nationally the strike is having a big impact on the company who have entered the crucial catalogue period. One worker said they have just had enough – they have mortgages to pay and families to look after and the aggressive shift patterns mean that the amount of time they get to spend with their families is dwindling. The strikers were supportive of the public sector strikes on 10 July and said that more united action is the way forward. Unite the Resistance hopes to achieve this aim and it’s Organising to Win conference on 15 November is a step towards that. This entry was posted on Jul 24, 2014 by leicestersocialistworkersparty in Industrial Action, Unions, Unite.